Many Upper Michigan attractions and activities are within an hour of Newberry, MI and the Quality Inn and Suites. 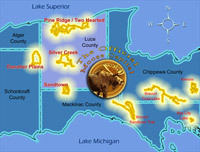 Our attractions map, snowmobiling map and ATV map make planning vacation pleasurable. Many Upper Michigan attractions and activities are within an hour of the Newberry Michigan. The Moose Capital invites you to take advantage of our Attractions, Snowmobile Activities and All Terrain Fun! Browse our incredible Newberry Michigan Maps below. General Map with Interactive Links to our Area Attractions, Interactive ATV / ORV Map that links directly to the DNR Map for each location, and also our Newberry Snowmobiling Map. Visitors have a "Natural Attraction" to Newberry Michigan - here you will find many activities and attractions to visit! 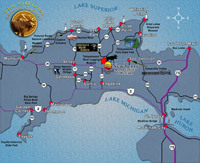 Easy to browse map of the Eastern Upper Peninsula and our locations for All Terrain or Off Road maps - these go directly to the Michigan Department of Natural Resources Maps. 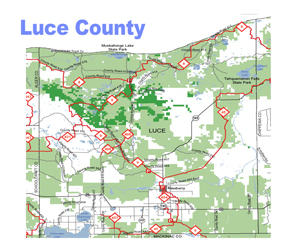 Upper Peninsula Luce County Snowmobile Map from the Michigan Department of Natural Resources. We thank you for utilizing our Newberry Michigan Directory and Information Hub: www.newberrymichigan.net Please feel free to contact us with any questions, comments and package details.